The mountainous position of Hamadan has led to the formation of many wonderful and beautiful caves of which according to specialists the Ali Sadr Cave is one of the most astonishing. Local people sometimes call it Ali Sadr or Ali sad. Located 60 kilometers north of Hamadan, Ali Sadr is a vast cave that contains a lake and a labyrinth of chambers along which one can sail for tens of kilometers. The clear water of the lake is several meters deep and the cave‘s walls, floor and ceiling are covered with an abundance of marvelous stalactites and stalagmites and various natural stones that have taken the shape of various animals, objects and islands. No living being lives in this cave and its waters because there is no natural light. However, there is power supply in the cave for lighting. In some of the 33 chambers the distance between the floor and ceiling of the cave reaches 40 meters, but the average height of the cave is about 8 meters. 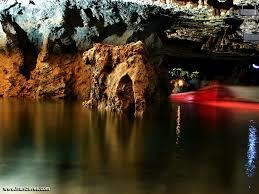 There are boating services with guides and catering facilities for those who wish to visit the cave.